Third Circuit District Court Judge Darien W. Nagata conducts a mock hearing with a former foster youth and an actual guardian ad litem acting out their respective roles. 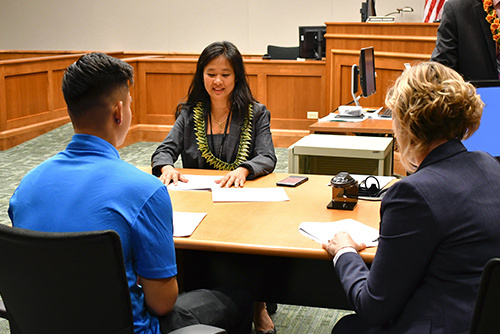 The mock hearing was designed to help youth at the second annual Teen Day in Hilo understand what occurs during a foster case court hearing with a judge. A record 42 youth attended the second annual Teen Day in Hilo, which featured a mock hearing, opportunities to explore community resources, take lessons on creating Dream Boards, and experiencing Lei Wisdom. This year’s event, held on October 12, was organized by the HI H.O.P.E.S Initiative. Activities for the second half of the day took place at the Aupuni Center and Hale Kaulike Courtroom, which was filled close to capacity. “The goals for Teen Day are to educate foster youth on what rights and services are available to them, expose to them to the court environment in a friendly, welcoming way, and to have fun,” said Third Circuit District Family Court Judge Darien Nagata. The Mock Hearing was one of the highlights of the day. Foster Youth have a right to be at their court hearings and are encouraged to attend. Judge Nagata and volunteers played the various roles of the parties in a real court proceeding. “We also encourage the foster youth to meet with the judges anytime,” said Judge Nagata. The teens who attended enjoyed the prize giveaways and before leaving each of them received a “Bag of Hope” containing an assortment of useful supplies and resources.